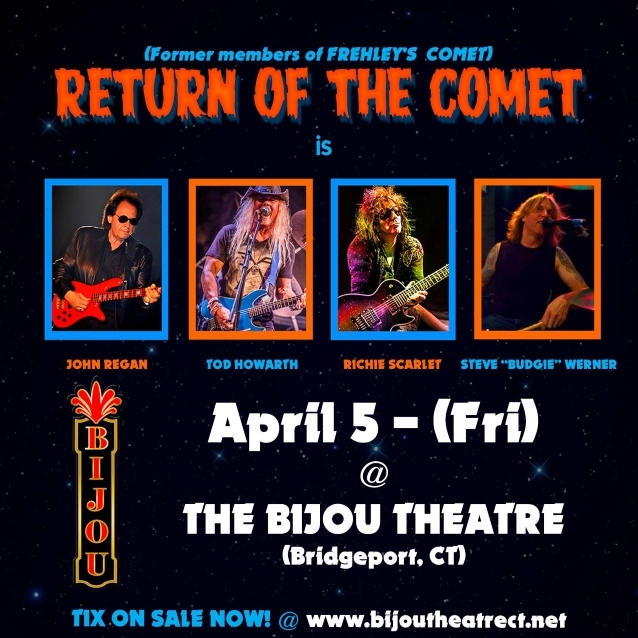 RETURN OF THE COMET, the new band featuring former FREHLEY'S COMET members John Regan (bass), Tod Howarth (guitar/lead vocals) and Richie Scarlet (guitar/lead vocals) along with ex-ACE FREHLEY drummer Steve Werner, performed live for the first time last night (Friday, April 5) at the Bijou Theatre in Bridgeport, Connecticut. Fan-filmed video footage of the concert can be seen below (courtesy of Mike Brunn). Original KISS guitarist Ace Frehley, Regan and world-renowned drummer Anton Fig formed FREHLEY'S COMET in 1984. The band went on to sell well over 1.5 million albums and had multiple MTV music videos in heavy rotation from 1987 to 1990. 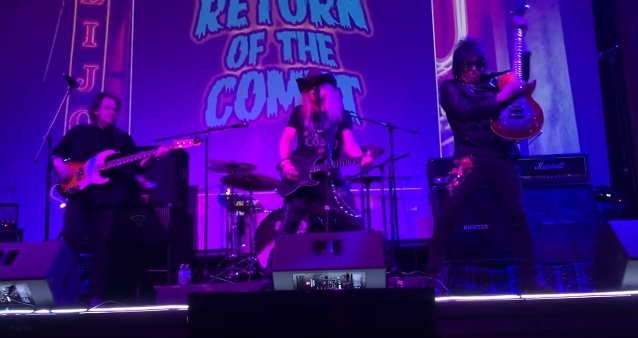 Now for the first time ever, FREHLEY'S COMET alumni Regan, Howarth and Scarlet, along with Werner, are celebrating their writing, recording, touring and co-production contributions to the FREHLEY'S COMET legacy by performing the hits and classics from the FREHLEY'S COMET catalog and more under the name RETURN OF THE COMET. Scarlet was in FREHLEY'S COMET from 1984 to 1985 and played in three of the band's seven different lineups. Howarth was in FREHLEY'S COMET from 1986 to 1988 and was in the group's last three lineups. Both Frehley and Regan were members of FREHLEY'S COMET for the duration of the band's four-year existence. Frehley told Ultimate Classic Rock that the keyboards on FREHLEY'S COMET's debut album were a result of "Howarth's influence." He explained: "I tried to keep the keyboards to a minimum, because I'm really not a keyboard guy. KISS never really used them, except on a couple of songs. I always wanted to follow the same direction with my career as I had with KISS musically. 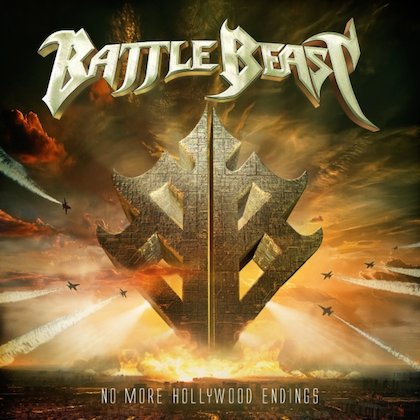 It was almost like I had to fight to keep more keyboards off the record, because I was there with three other band members and my producer." In a 2017 interview with the Poughkeepsie Journal, Regan — who met Frehley in the mid-1980s at a friend's recording studio in White Plains, New York — described Ace as "a kook, in a good sense. In a world full of copies, he's a one-off. He's an original." Frehley reunited with Regan and Howarth to perform the songs "Rock Soldiers" and "Cold Gin" during his September 2017 concert in Poughkeepsie, New York.